Art depicting SpaceIL's Beresheet Lander on the moon. "Moon of Israel" is an epic 1924 film from the golden era of silent movies, and helped launch the directing career of Michael Curtiz, of "Casablanca" fame. Sequels seldom live up to the original. 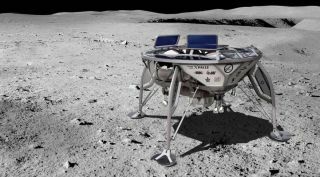 But if Israel's plans to put a robotic lander on the moon in February 2019 can be considered a sequel, this new "Moon of Israel" mission, led by the nonprofit company SpaceIL, will be a blockbuster in its own right. Lunar landings date back to the 1960s. The United States landed 12 people on six separate occasions as part of the Apollo program, along with robotic spacecraft such as Surveyor, which served as a precursor to human missions. The Soviet Union preformed robotic Luna missions and landed Lunokhod automated rovers in the 1970s. Most recently China landed the Chang'e 4 robotic probe on the back side of the moon. These missions are all amazing technical accomplishments, and marvels of human know-how, sponsored and built by large government space agencies. China's Yutu 2 rover explores the far side of the moon shortly after its Jan. 2, 2019, touchdown. The moon's next visitor is different. SpaceIL's Beresheet — Hebrew for "In the Beginning" — will become the first privately funded mission to launch from Earth and land on the moon, and the first spacecraft to propel itself over the lunar surface after landing by "hopping" on its rocket engine to a second landing spot. The mission marks yet another milestone, not only in the history and technical arc of space exploration, but also in how humankind goes about space exploration. The Beresheet lander is about the size and shape of a family dinner table, roughly 6 feet in diameter and 4 feet high, weighing (on Earth) about 350 pounds. This doesn't include the nearly 1,000 pounds of fuel needed to land the spacecraft on the moon. Carrying instrumentation to measure the magnetic field of the moon, a laser-reflector provided by NASA and a time-capsule of cultural and historical Israeli artifacts, the mission will ride into space as a secondary payload — like a rideshare passenger — aboard a SpaceX Falcon 9 rocket. The primary cargo on the SpaceX launch is not the SpaceIL lander, but instead a communications satellite for delivery a very high Earth-centered, geostationary orbit approximately 22,000 miles above the Earth's equator. This effectively parks the communications satellite above a fixed point on the Earth, its orbit synchronized precisely with our planet's daily rotation. The Beresheet spacecraft will accompany the primary satellite on its journey. But in order to reach the moon, it needs to travel more than 10 times farther. In spaceflight, the primary constraint in traveling from place to place is not distance, but the quantity of energy required. The Falcon 9 rocket only carries Beresheet about 10 percent of the total distance to the moon. But it provides nearly 90 percent of the total energy required to get there. Consequently, once lifted from the surface of the Earth, and with a small amount of additional energy from its own propulsion system, Beresheet can boost its own orbit by positioning itself so that it's captured by the moon's gravitational pull. This process will take several weeks. Once landed on the moon, however, the mission may only last a few more days. The lander is not designed for the long haul, but instead will demonstrate advances in technology as well as the business model for a privately funded spacecraft landing on another body in the solar system. In this sense, Beresheet will create a second and even more memorable "Moon of Israel." There is no air on the moon — and therefore also no sound. So, like the original 1924 film, this sequel will also be silent. But the participants are not actors, and the view will be in high-definition color. The technical know-how developed by the engineering team, the scientific and technical data from the spacecraft's instruments, learning how spaceflight missions can be executed outside of a government program, and the inspiration provided for an entire generation of young people — especially in Israel and the Middle East region — will all bring valuable insights and inspiration for decades to come.